Do you have an FM radio in your cellphone? If so, its antenna is the headphone or ear bud wires. You can buy an external FM antenna that plus into the headphone jack. 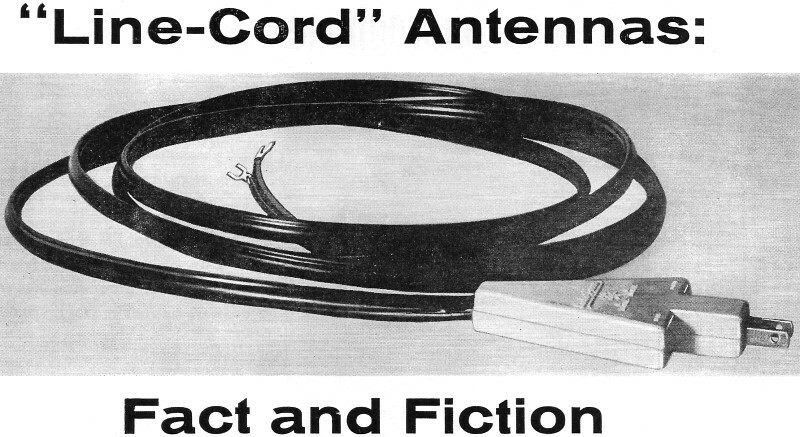 Do you remember the type of line cord antenna described here? It was actually not a bad idea in many situations. Although the appliance might look a bit scary, there is no direct physical contact between the antenna wires and the house AC supply. 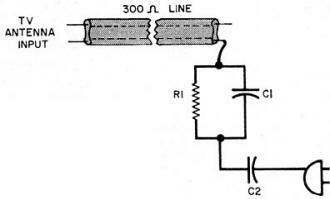 Either a capacitor with low impedance in the radio and/or television band was connected to the plug blade or a capacitively coupled plate was placed around the AC wires to pick up signals. 60 (or 50) cycle content on the antenna would be minimal and rejected by the receiver front end filtering. Many of the problems people had with this or any twin-lead transmission cable were due to improper routing near metallic and/or signal-carrying objects. The beauty of coaxial cable is that the outer shield permits nearly indiscriminate routing without concern for disturbing the cable's impedance or stray signal pickup. Although this type of line-cord antenna is no longer sold, you can open up any plug-in FM radio that does not have an external antenna and find a length of wire spiraled around the AC line cord inside the radio chassis; that is its FM antenna. Neither miracles nor frauds, these signal couplers may prove quite satisfactory in some circumstances. Question: Line-cord antennas are now being promoted heavily as the long-sought miracle solution to the problem of the external TV antenna. They are also being attacked as completely fraudulent. Which side is right? Do they work or don't they? Answer: They do "work." Regarding the claims and counterclaims, neither extreme is true. There are situations in which they would be useful for TV and FM reception. They are definitely more than "just a length of wire." Question: Some critics suggest that these units introduce shock hazards. Are the units dangerous enough to cause concern? Answer: They are no more hazardous than many radios, TV receivers, and other household appliances. In fact, they tend to be safer than most such electrical equipment. Question: Are they worth trying? Answer: One of them might be worth a try - under the right conditions and at the right price - but buying blindly is not recommended. If your particular situation warrants a try, you can protect yourself with a money-back guarantee. Fig. 1 - A typical network in one of the plug-in type antenna couplers. Fig. 2 - Another type of line-cord coupler picks up through a metal plate. Though it occurred more than thirty years ago, we clearly recall an incident involving an old-time radio buff. He was grinning over a gadget that looked like a diamond-shaped spider web and stood about two feet high. It was an open-loop antenna that he could use indoors on top of his radio cabinet - and it worked. He no longer had to string wire all over his roof. 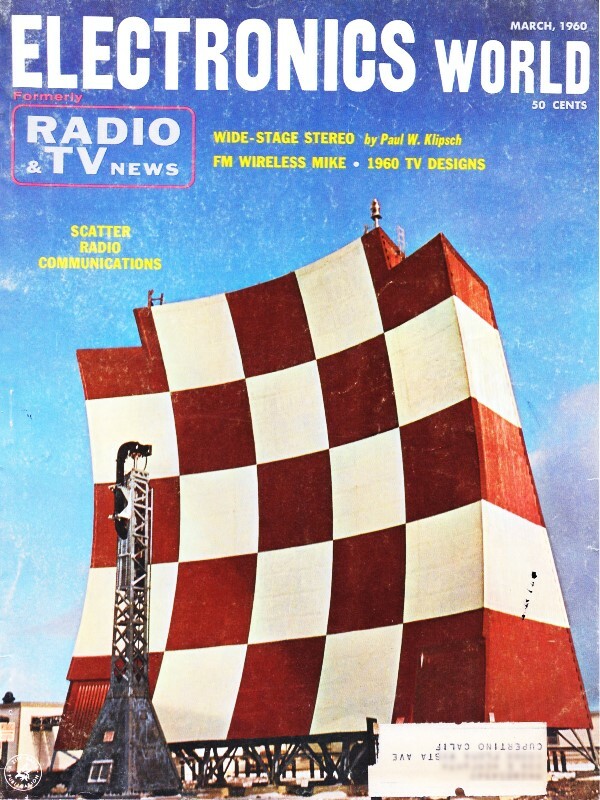 A few years later, even this was outmoded by smaller loops inside the radios, out of sight. They also worked. Just a few years ago, TV viewers were being tempted by what appeared to be a comparable miracle: a single length of wire connected to one side of the TV set's antenna input at one end and terminated at the other end in an intriguing little box. The miracle, inside the box, was a capacitor, a pitch-like material, a slab of rubber, or thin air. With the box snipped off, the wire worked just as well, which was not well at all. The latest contender for "miracle" status is a length of 300-ohm lead that also terminates in a box, with the latter plugging into (or otherwise coupling to) house wiring. This "revolutionary discovery," often represented as using "radar principles," is said to "convert your house wiring into a giant TV or FM antenna." Tests on typical units quickly revealed, alas, that the long-awaited miracle is not yet here. However, the mystery box now contains something that makes enough sense to deliver reasonable results in many cases. Following unfavorable comment by the National Better Business Bureau and other agencies, many have gathered that the devices are complete frauds. Much as we would like to wear the mantle of the fearless crusader, we cannot dismiss the line-cord devices so unqualifiedly. The BBB attack is largely against the misleading advertising promulgated by many, though not all, of the manufacturers or purveyors of the devices. As to actual performance, the BBB quotes other sources. These other sources appear to have been rather hasty in their tests and in the conclusions drawn from them. The unit shown at the beginning of this article is typical of most available. Inner detail appears in Fig. 1. It consists of a simple RC high-pass filter in series with a blocking capacitor, to keep d.c. or low-frequency a.c. out of the TV set's antenna input. The network is connected between one leg of the house wiring and one side of the antenna input. Component values, which are not particularly critical, vary somewhat from one manufacturer to another. R1 may be in the order of 500,000 ohms, C1 is generally a few hundred micro-microfarads, and C2 is larger, but small enough to impede 60 cycles - say about 0.05 μf. Conscious of the need for electrical safety, most manufacturers have used units rated at 1000 volts or more for C1 and C2. 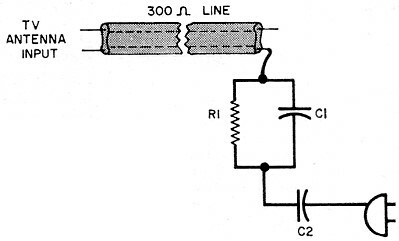 Since there is connection to only one side of the a.c. line, there is no complete circuit path even in the unlikely event of a short. Another type of unit (Fig. 2) is one that clamps to the line cord of the TV or FM set, rather than connecting to a wall outlet. In this variation, the line cord is run parallel to a metal plate that connects to one side of the antenna lead, but a thickness of plastic provides spacing between the two. This arrangement, although it looks less impressive than that in Fig. 1, generally performed better. Shock hazard with this well-insulated device is even less than with the type first described, being virtually non-existent. Either type of unit will definitely couple whatever signal is actually intercepted by house wiring, with reasonable efficiency, into the attached transmission line while being relatively insensitive to undesired phenomena on the a.c. line that are lower in frequency. An important question remains: How much signal is there in house wiring? It is not true, as some have stated, that its effectiveness is insignificant because it is shielded and grounded. Once we move a few feet from the physical ground point of the house-wiring system, we lose our low-impedance path in the v.h.f. band. Signals this high in frequency that reach cable shielding will be coupled quite well to the wiring inside the shielding. The capture area of an antenna is some indication of its sensitivity. To this concept we owe the practice of counting the number of elements in an unknown array for an estimate of its probable performance. From this, a considerable maze of house wiring would appear to be most promising. Unfortunately, a good antenna system has quite a few other requirements, and power-line cabling falls short on these. A good antenna is seldom an accident. The size, shape, orientation, and spacing of its various elements are carefully worked out. It is designed to match a specified impedance. It is faced in a given direction for optimum performance. Except by an occasional lucky accident, your wiring is likely to rate low in these important respects, although not zero. Thus, in general, the line-cord couplers will not give you performance that even approaches that of a moderately effective outdoor unit. Performance is roughly comparable to that of an indoor rabbit-ear dipole, although there is appreciable variation depending on the unknown quantity to which you are coupling. To a considerable extent, then, you are taking pot luck. More specifically, you are not likely to do well with one of these units unless signal availability in your area is good, and ghosts due to reflected signals are not a problem. If you fall into this category, of course, more conventional indoor and outdoor antennas will also work. However, you may be able to avoid the periodic repair-and-replacement requirements of the latter and the obvious appearance of the former. If you live in an apartment house or other building with a metal superstructure, this metal is much more likely to screen out the desired signal than will any shielding or grounding associated with the power-line system. In fact, it was only in test situations in such locations that coupling to the a.c. line provided little improvement over reception obtained by simply running a few feet of transmission line, connected to the antenna input, along the floor. The couplers performed most reliably on the lower v.h.f. TV band and the lower portion of the FM band. At the top of the FM band and on high TV channels (7 and above), performance was much more critical; that is, slight changes in the position of the connecting transmission line produced noticeable changes in reception. With a sensitive FM tuner in a good location, the couplers are likely to give their best showing. In fact, many manufacturers of FM receivers have been using similar built-in line-cord antennas in their models for several years. Thus the principle of operation is scarcely "new and revolutionary." If good reception is obtained with one of these units on some desired transmissions but not all, some manipulation is possible. With the plug-in type, trying another wall outlet or plugging other appliances into the outlet it uses (adding "elements," in other words) can help. With the clamp-on type, moving it to different positions along the line cord provided an unexpected flexibility of adjustment. Since there is no reliable way of pre­dicting whether a line-cord coupler will give satisfaction in any individual case, you should never buy one without a clear-cut money-back guarantee if you are not satisfied. Fortunately, the adapters are widely available on that basis. Another objection to the couplers is their cost, if one is to judge by the list prices (up to $6.00). However, these prices have been plunging rapidly and, since mark-ups appear rather high, large discounts are available. You can make up one of the units shown in Fig. 1 for about a dollar, if you are so inclined. If you don't want to bother, be your own judge of how much more than that you are willing to spend, with a suitable guarantee, for trying one out with no risk. If it gives satisfactory reception, you have yourself a bargain to the extent that you have saved the additional expense of a conventional indoor or outdoor antenna.